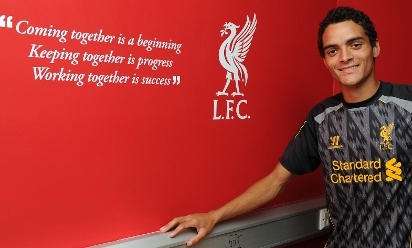 If you're considering adding Ilori's name to your official Liverpool jersey, it may be prudent to avoid selecting his full name - the Portuguese's complete title is Tiago Abiola Delfim Almeida Ilori. Tiago hails from a cosmopolitan background, having been born in England with a Nigerian father and Portuguese mother. He lived in the Iberian country for more than a decade and, although he can speak fluent English, considers himself Portuguese. 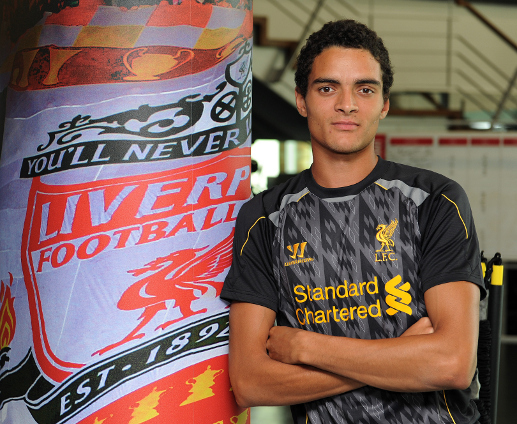 Ilori is the third Portuguese player to join Liverpool, following in the footsteps of Abel Xavier - who signed from Everton in 2002 - and midfielder Raul Meireles. The latter moved from Porto in 2010. He is also the first player to switch from Sporting to Liverpool. The only previous transfer deal between the two clubs was the sale of Emiliano Insua to the Portuguese side from the Reds in August 2011. The defender already has experience of Anfield and Liverpool; Ilori was a member of the Sporting side which won 3-0 on Merseyside in the 2011-12 NextGen Series and later thrashed the young Reds 5-1 in Portugal. "We're not used to these big stadiums, this is what we work for every day - it was great," Ilori said after tasting the atmosphere at the Reds' home in August 2011. Ilori wore No.34 during his time at Sporting but is likely to change after arriving at Anfield - that number has already been taken by new defensive colleague Martin Kelly. On the day Ilori celebrated his 19th birthday - February 26, 2012 - Liverpool were lifting the Carling Cup after beating Cardiff at Wembley. The youngster has yet to win a major trophy in his fledgling career. Ilori was the fastest player ever recorded over 30 metre sprints at Sporting's academy set-up, breaking the times of the likes of pace merchants Nani, Ricardo Quaresma and Cristiano Ronaldo in the process. The defender's arrival at Anfield increases the number of nationalities within the Liverpool first team to 16, adding Portugal to: Australia, Belgium, Brazil, Denmark, England, France, Germany, Italy, Ivory Coast, Morocco, Northern Ireland, Slovakia, Spain, Uruguay, Wales.